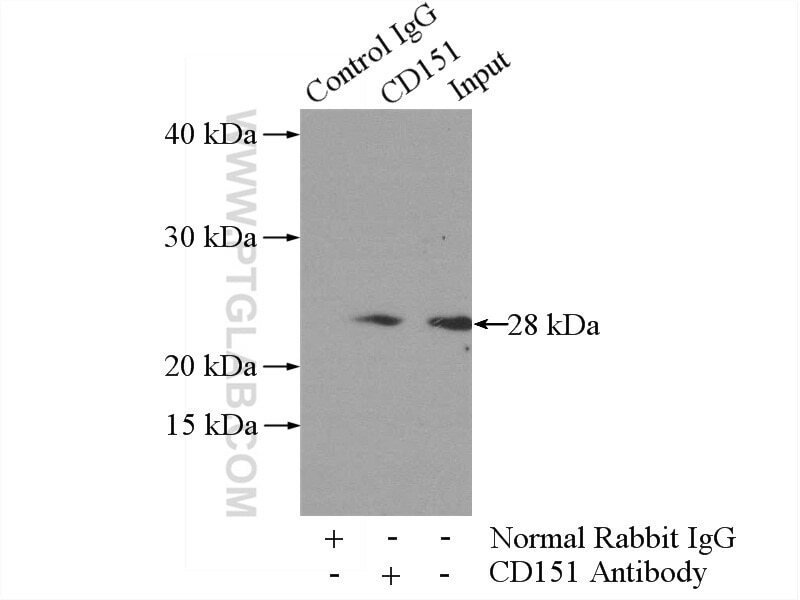 IP Result of anti-CD151 (IP:10418-1-AP, 3ug; Detection:10418-1-AP 1:300) with mouse spleen tissue lysate 4000ug. CD151 (also known as TSPAN24) is a membrane protein of the tetraspanin superfamily, which are characterized by the presence of four conserved transmembrane regions. Many of these members are involved in the regulation of cell development, activation, growth and motility. CD151 is broadly expressed by a variety of cell types. It is involved in cellular processes including cell adhesion and may regulate integrin trafficking and/or function. CD151 enhances cell motility, invasion and metastasis of cancer cells. Tetraspanin CD9 is involved in the migration of retinal microvascular endothelial cells.